Prudence Ainslie (born 1990) has focussed on documenting place with the intention of analysing and re-processing the viewing experience. Her prints demonstrate a particular interest in exploring the relationship between the two-dimensional and three-dimensional. This can be seen in two recent prints from the Fold series, 2015. Working in Iceland Ainslie photographed a sequence of scenes in the atmospheric winter light. 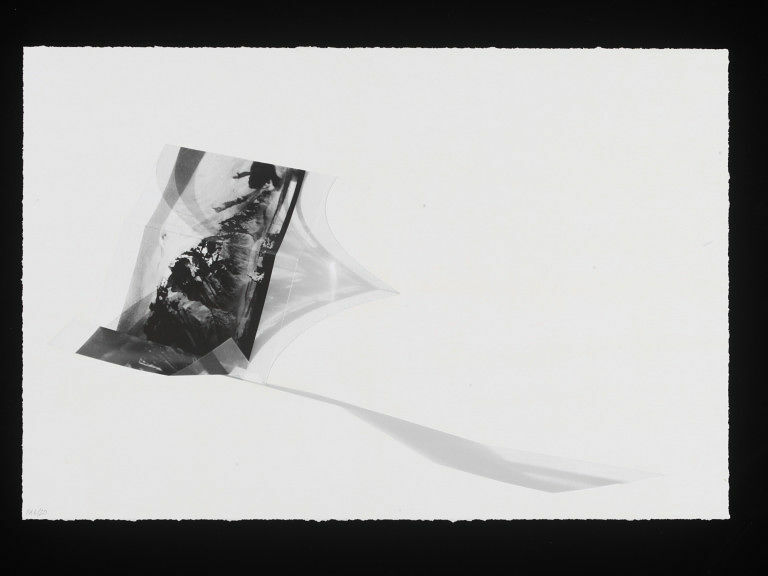 Selected frames were printed onto clear film and formed into folded 3-dimensional objects. These objects were then re-photographed using natural winter light, capturing both the scene and the shadow cast by the light conditions prevailing during the taking of the initial photographs. This photograph of the 3D object and its shadow is printed as an archival digital print and the woodcut printed area perfectly mimics the shape of both the 3-D structure and its shadow as one flattened form. The subtle opaque surface of the woodcut is in contrast to the illusion of the 3-dimensional form and shadow. By using contrasting print media Ainslie is able to create a subtly layered illusion which fluctuates between readings of 2 and 3 dimensions, and uses transparency – of pigment, of image – to allude to the transparency of film, and the idea of the camera as a filter for the experience of looking. Artist's initials; edition number; All in pencil. Edition number; title; signature. All in pencil on the back.